The Roundtable for Peace on the Korean Peninsular, held by the World Methodist Council, the United Methodist Church, and the Korean Methodist Church, in Atlanta Nov. 9 – 11 was hosted by the United Methodist Board of Global Ministries. Delegates included host participants and individuals concerned with this vital peace process. Since the previous meetings of the Roundtable in Houston in 2016 and in Seoul in 2017, events have been tumultuous. They have ranged from a near-war situation in 2017 to the rapprochement of the Panmunjom and the Pyongyang meetings of President Moon Jae-In and Chairman Kim Jong-Un, and the Singapore meeting of Chairman Kim Jong-Un with President Trump. The Roundtable was chaired by World Methodist Council President, the Rev. Dr. J.C. Park. Greetings were received from President Moon Jae In and from Consul General Young Jun Kim. The gathering opened with a presentation from Jimmy Carter, 39th President of the United States. President Carter noted the ‘step-by-step’ nature of the process, commenting that ‘democratization and re-unification are two sides of the one coin.’ He recognised the wish of North Korea to be ‘acceptable in the community of nations’ and applauded the ‘historic’ efforts of President Moon towards a new relationship with North Korea. The Roundtable featured presentations from individuals and in panel form, offering both historical and theological reflection on the Korean Peninsular over the past 100 years and more. The role of countries such as China and Japan, and more recently, the United States, was noted and analysed. Noteworthy was the thoughtful and deep consideration of how past hurts should be handled and reconciliation achieved. There were stories of courageous and creative moves to bridge the divide between South and North Korea. Bishop Ivan Abrahams, General Secretary of the World Methodist Council, gives the sermon during closing worship at the Roundtable for Peace on the Korean Peninsula at Grace United Methodist Church in Atlanta. Photo by Mike DuBose, UMNS. The public Worship Service, offered by WMC General Secretary, Bishop Ivan Abrahams, was enriched by music and singing from a number of choirs. 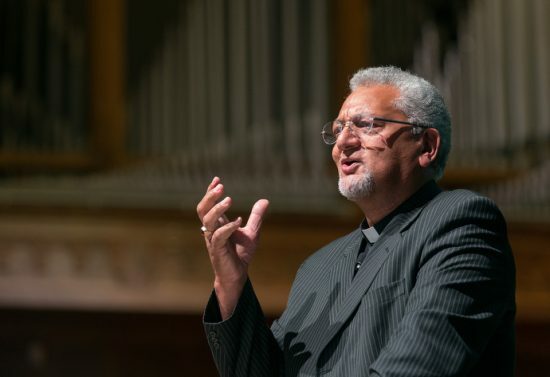 Bishop Abrahams reflected on issues of hurt and reconciliation. He expressed ‘hope to see a united Korea in our lifetime.’ Delegates and visitors shared in a celebration of Holy Communion. During the proceedings, a writing group met to draft an Atlanta Statement, the agreed text of which may be found here: https://www.umcmission.org/learn-about-us/news-and-stories/2018/ november/declarations-and-statement-for-peace-korean-peninsula. A concluding act of worship focussed on a map of Korea and on places where atrocities had happened, stories were heard and prayers made for healing and reconciliation.